To achieve ultimate enjoyment of this album there must be prerequisites: 1. you like metal or heavy guitar riffs (in my locality, we call it as "jeg-e-jeg" emulating the riffs sound), 2. open mind. Otherwise, forget it! Don't bother about this album. For me personally, this is an excellent power metal album and I don't really care whether or not this album is prog. Let's say it's 90% power metal and the remaining 10% is up to you to judge. It can be considered as prog as it has some tempo changes as well. But man . this album BLEW me at first spin! I like the power, the heavy guitar riffs, the symphonic keyboard sound, screaming vocal (sometimes a bit growling - never mind; Pain of Salvation has done it a lot - but still OK right?). Most of all, the music is truly melodic! BUY IT NOW! (I plan to buy it as the CD with me is on loan basis from my prog metal colleague, David). "The Great Deceiver" (I thought was a cover of King Crimson; it's not) blasts the album off with full power and speed of metal music! Yeah mannn .. it's metal!! The guitar fills accompanied with powerful bass line with double pedal bass drum open the track in perfect harmony. It is followed by screaming vocal. Keyboard sound plays a role as back sound during the vocal takes the lead. But when there is a change in tempo to a slower one, it accentuates the transition nicely (augmented with a vibe sound as well). I like the simple guitar riffs (well . it's typical metal song - but it's really cool .). The solo guitar is really stunning. "End Of Your Days" starts of with ambient keyboard sound followed by speed guitar riffs and dynamic drumming. This track has a very nice interlude in moderate tempo (not in full speed) with stunning guitar solo backed with melodic keyboard sounds. This track reminds me to Symphony X music. The vocal is actually reminiscent of Symphony X vocalist (Russel Allen). "As I Lie Here Bleeding" is a straightforward heavy metal / hard rock tune with nice piano touch, dazzling bass line. The vocal harmony is really nice even though the melody is repeated quite often. 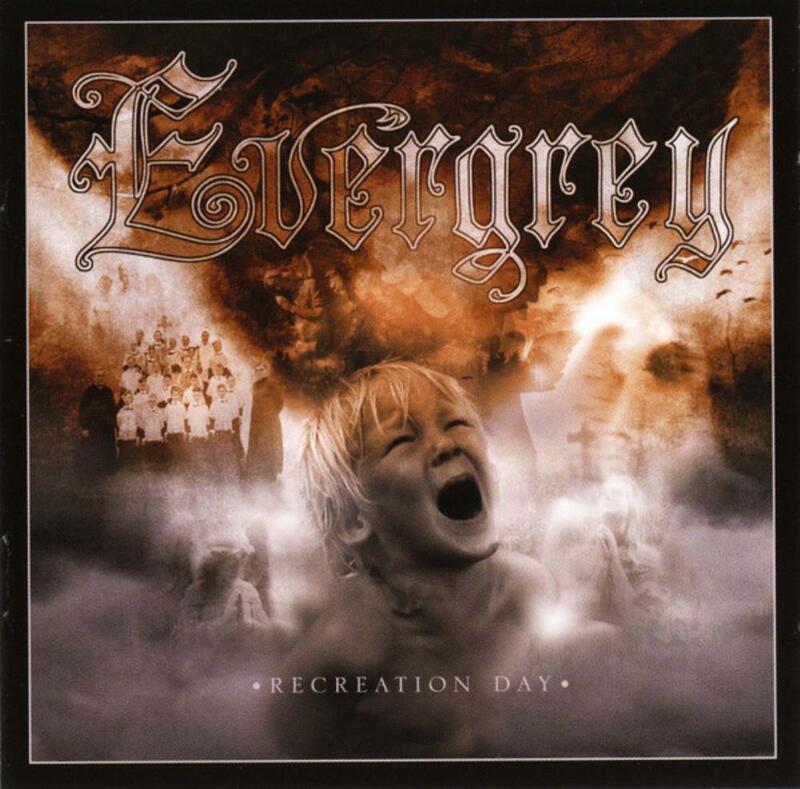 The title track "Recreation Day" seems like a prog metal music at the opening part. But I observe the keyboard sound at background creates a nuance of rather mellow music. The music moves into faster tempo with lead guitar melody but it then turns quieter with much melodic style in slow tempo. The ending part is dominated by keyboard sound in symphonic style. "Visions" brings the music back into full power and speed. The guitar riffs are played softly when vocal line enters the music. But at the end of vocal passage the riffs turn heavier. Oh man . this is METAL!! This track brings your adrenalin exploded really! (especially having heard slow track before this). But the music than turns to a moderate tempo during interlude with stunning guitar solo. Keyboard sounds augment nicely during this passage. In this track I can hear heavy guitar riffs marry nicely with symphonic keyboard. "I'm Sorry " is a mellow track with nice melody, excellent lead guitar with some riffs. It flows to the next track "Blinded" in heavier mode with great keyboard sound and vocal line. Superb lead guitar. "Fragments" opens the track with simple guitar solo. When vocal line enters the tempo turns into moderate and moves back to faster one with guitar riffs, growling backing vocals. When the guitar takes the lead during interlude, the music turns like a heavy metal tune. This track has many tempo / melody changes. This is one of my favorite. It's really excellent. "Madness Caught Another Victim" is a short track with excellent acoustic guitar rhythm and fills. Now the voice reminds me to the voice of David Coverdale of Deep Purple / Whitesnake. (Specifically, it reminds me to Coverdale / Vandenbergh acoustic live "Starkers in Tokyo"). "Your Darkest Hour" brings again the heavy metal spirit back on track. It's a nice straightforward rock tune. "Unforgivable" concludes the track in prog metal scene with great melody especially during slow passage with melodic voice line. This track confirms the symphonic nature of the band's music packaged in prog metal mood. The bonus track "Trilogy Of The Damned" is a nice mellow track.Excellent. It reminds me, somehow, with Dream Theater's "Space Dye Vest"; not in totality but in nuance. Sort of that .. Highly recommended album! Rating: 4.25 / 5. GW, Indonesia.